For me, Sundays mark the time to get rid of any extra ingredients I have left over from the past week's meals in order to make room for my new farmers market purchases. Each Sunday, I take stock of everything I have left in my refrigerator and plan a meal based on whatever that may be. 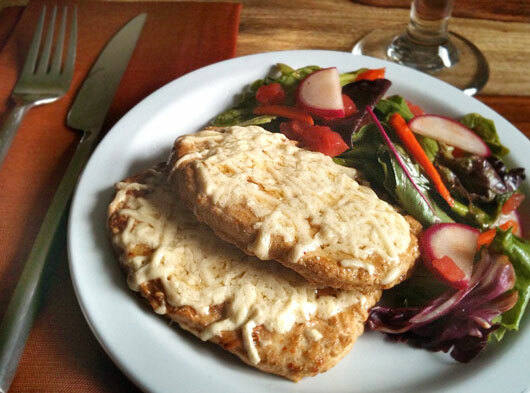 Tonight: Gardein Chick'n Scallopini filets, Daiya mozzarella and some leftover greens perfect for a garden salad with a light balsamic vinaigrette. A side note: while I don't advocate a pure vegetarian diet heavy in processed fake meats and cheeses, Daiya is perhaps the single best vegetarian cheese substitute on the market and can generally be found at your local Whole Foods. Made primarily from tapioca and arrowroot flours, it is all natural, 100% pure vegetarian, and melts and tastes just like cheese. Every once in a while, I use Daiya when I crave something cheesy. Daiya is also a useful product for easing into the no dairy lifestyle if you're just starting out or are pure-veg curious. Gardein is another substitute I use when I want to make a dish that truly mimics meat. It is the only mock meat product I will use and is another perfect way to ease into a pure veg diet — eventually you will graduate to mostly seitan, tempeh and tofu for your main protein source. Gardein is made from vegetables and grains (like quinoa), and does contain some soy. It should be fairly easy to find in any natural foods market. Prepare the vinaigrette: Combine the vinegar, mustard, and garlic in a small bowl. Pour in the oil in a slow steady stream, whisking constantly. Season with salt and pepper to taste. Whisk well before using. Cook the chick'n: Preheat the oven to 350°. Remove the Gardein filets from the package and sauté in olive oil over medium heat until golden brown and cooked through, about 2 - 3 minutes on each side. Sprinkle Daiya over each filet and transfer the pan directly to the oven (if your pan is not oven-safe, transfer filets to a baking dish or sheet lined with foil). Cook for about 10 minutes, until the Daiya is melted. Meanwhile, make the salad: Place the baby greens in a medium bowl. Add the carrot, radish and tomato and lightly toss (I use my hands to really give it lots of love). Pour dressing over salad and lightly toss again to incorporate. When the Daiya has melted, remove the pan from the oven and divide the chick'n filets between plates. Add salad to each plate and serve. Thanks, Yvonne. I'll check out your recipes, too!